Photo by Dan RockafellowLocated directly in front of the home’s entry, the great room offers a striking first impression with its 16-foot ceilings and large antique beams. A towering Rumford fireplace made of hand-carved stone serves as the focal point of the room, and a built-in arch was provided specifically for Karen’s 1870s piano handed down from her grandmother. An antique hutch houses a collection of prized Toby mugs in here, and a large iron chandelier provides an elegant source of lighting. Rob and Karen Lieurance raised their three children, now 18, 16 and 13, in their former Joplin house. 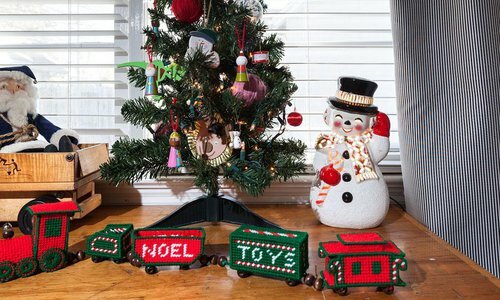 This old house, where they lived for 15 years, was a place where Karen stashed antique finds throughout the years, knowing someday she would find just the right place for each one. And it was from that old home’s kitchen window that she could see a large hill, which she often thought would be the perfect place to build a dream house. 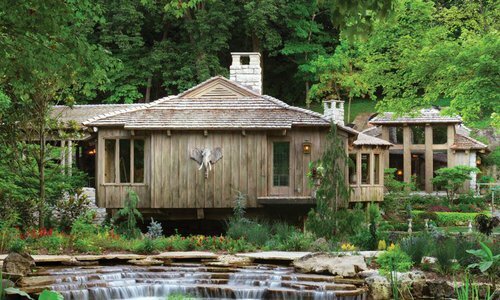 The Lieurances eventually bought 25 acres on that hill, and several years later, the family began the long process of building their dream home. Photos by Dan Rockafellow (Left) The upstairs bar near the kitchen is a favorite entertaining spot for the Lieurances. It was modeled after a picture of an antique bar Karen has always loved. 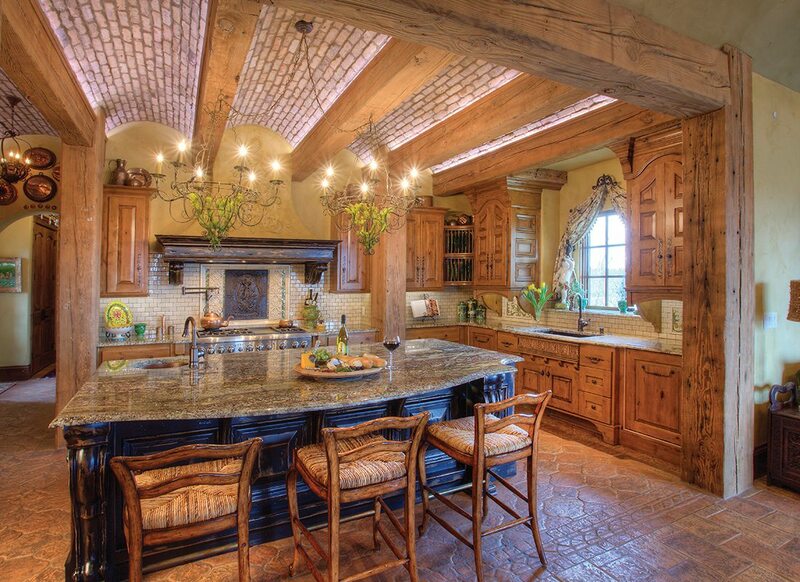 Antique beams add rustic definition to the space, and the chandelier provides elegance. The vintage cabinet, one of Karen’s treasures found years earlier, was specially built into the stonework. A hammered copper sink features a fleur-de-lis design, and the bar’s back window opens to the patio’s barbecue area for easy entertaining. 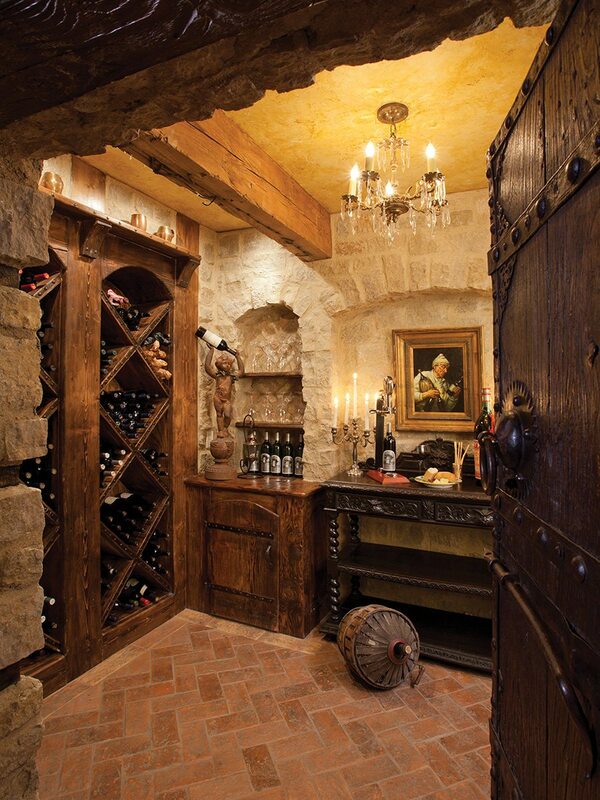 (Right) Large antique doors from Albuquerque make an immediate statement leading into the wine room. Stonework by G.R. Tracy Masonry was customized to allow the doors to open in both directions. Located underneath a patio, the room is all cement, creating the perfect climate for storing wine. 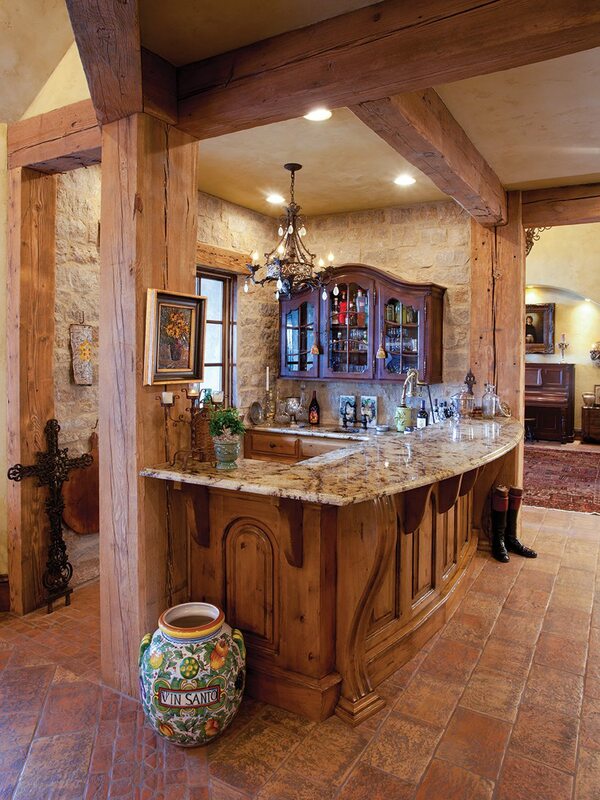 An antique buffet adds a rustic ambiance, and a French piece stores wine bottles upside down. Reclaimed wood shelving adds additional storage and character. 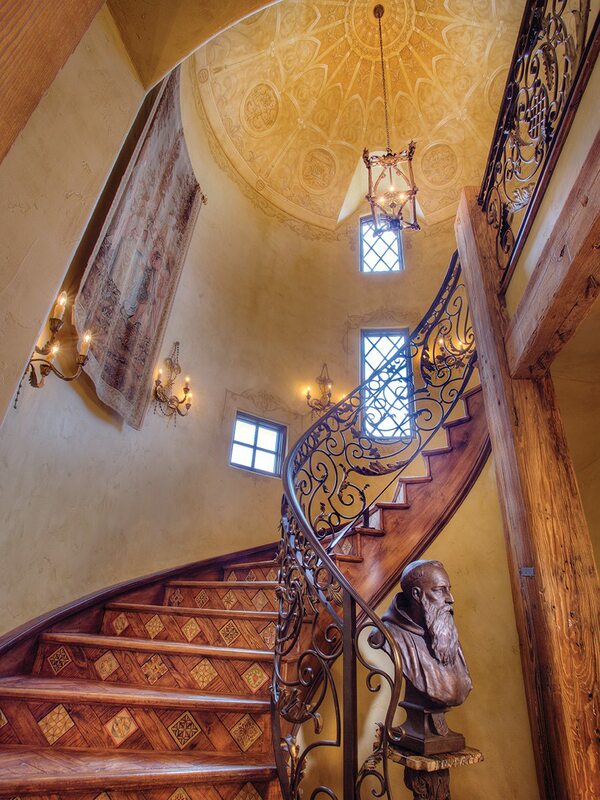 Photos by Dan Rockafellow (Left) The home’s spiral staircase, enclosed in a turret, is a testament to the Lieurances Old World style. Steps made of reclaimed wood have a herringbone design with inlaid, hand-painted tiles set on a bias. An antique carriage light illuminates a freehand painting by local artist, Matt Myers, and the intricate artwork features hidden “green man” faces—the sun, moon, stars and more. The balcony’s railing by Advanced Ironworks was designed from pictures Karen collected over the years. 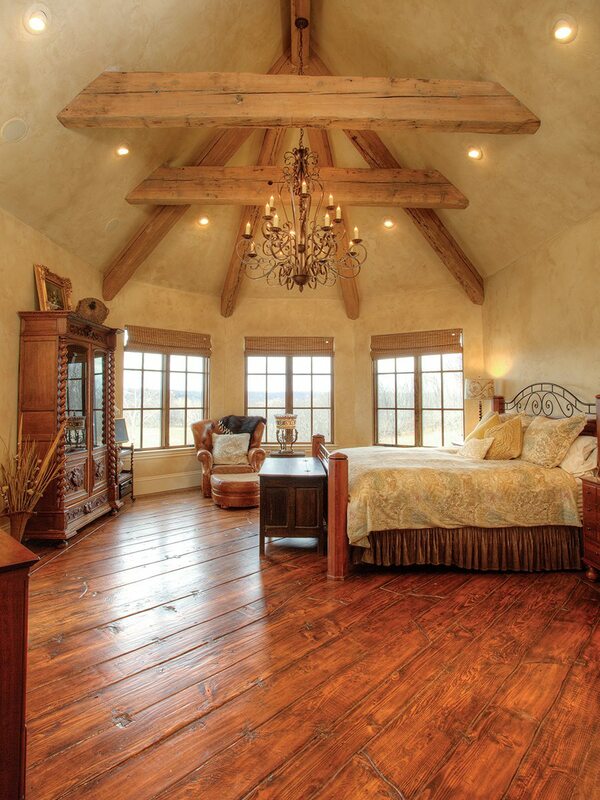 (Middle) Large reclaimed wood beams make an immediate statement in the master bedroom. The wood came from a textile mill in West Virginia and a tobacco plant in North Carolina and still has nails from its previous life, giving the room a rugged feel. 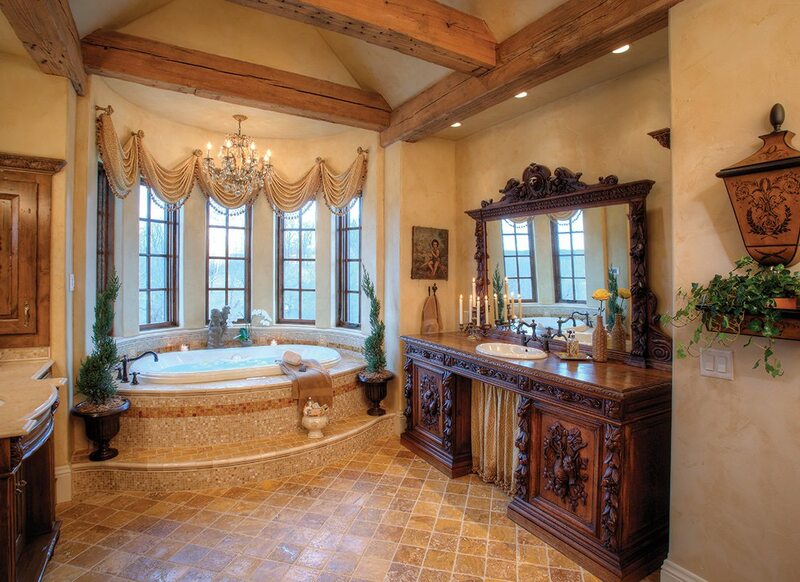 Tall ceilings and a scroll chandelier offer an elegant touch. 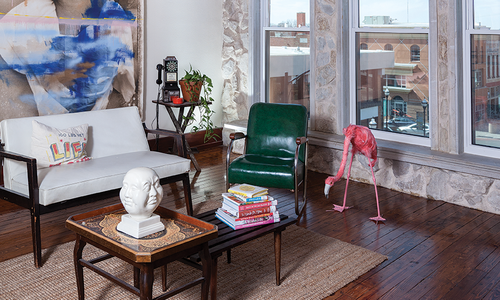 Floors are made with reclaimed wide plank wood, and a butterscotch color and glaze treatment on the walls completes the room’s Old World atmosphere. 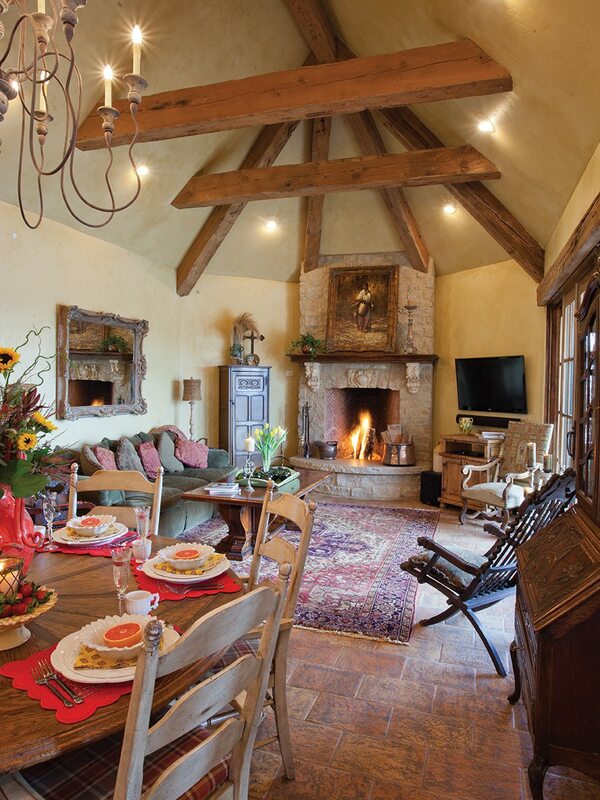 (Right) Located off the kitchen, the hearth room serves as the home’s main gathering place. 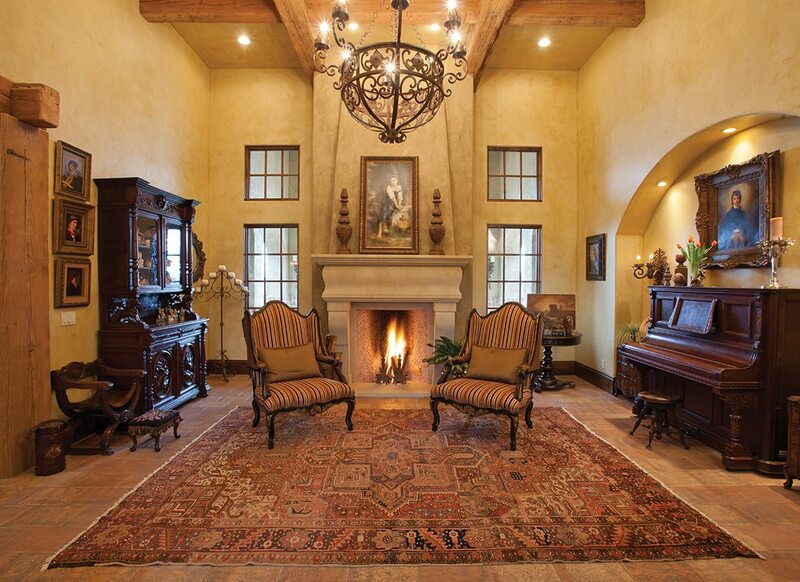 A Rumford wood-burning fireplace made of hand-carved stone adds significant warmth and character. The edges of the herringbone-patterned firebrick are chipped to create an artisan look. Hand-carved stone corbels flank either side of the fireplace, and a small cartouche set into the stonework decorates the center. Nearby, French doors lead to the back patio’s wood-fired pizza oven. Photo by Dan RockafellowKaren even incorporated antique pieces she found long ago into the master bathroom. A sink was added to be functional, and shiny European hardware was treated to give a worn look. The room’s large BainUltra air tub is embraced by tall windows, which offer a beautiful (yet still private) view. Custom home designer Ron Hill created the shower’s one-of-a-kind snail shell design and used ceramic, onyx, glass and stone to complete the tile layout. 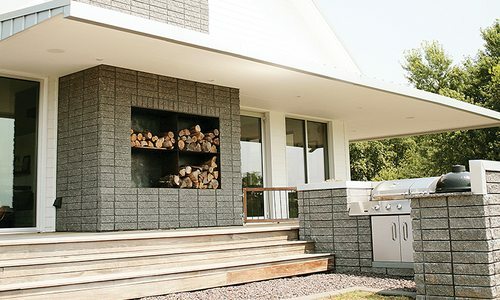 Paul and Hannah Catlett’s custom-built home brings modern design and environmentally friendlyfeatures to a rural Springfield setting.